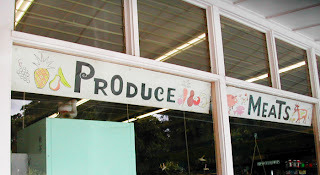 These are some funky old signs and a mural (shot from the outside) from a grocery store in Koloa town on Kaua'i. The typography is pure 60s--could they really be that old? I love the little illustrations on either side of the words. Hope to post more stuff like this every once in a while. I love the mural. 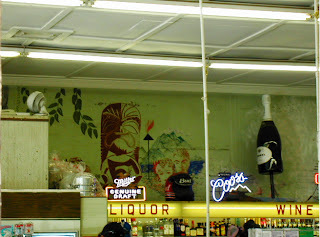 Your so lucky, the liquor store I go to only has faux wood paneling and low ceilings.